1. Mix the soy, garlic, honey, vinegar and chilli paste in a mixing bowl. Slice the steak as thinly as possible and add to the marinade while you prepare the vegetables. 2. Heat ½ tbsp oil over a high heat in a large non-stick frying pan. When smoking, lift the beef from the marinade, scraping any excess liquid back into the bowl, and stir-fry for 2-3 minutes until charred and sticky in places. Scoop the beef out of the pan onto a plate. 3. Add the remaining ½ tbsp oil to the pan, toss in the carrots and beans, and stir-fry for 3-4 minutes. Tip in ½ the reserved marinade and cook for another minute until syrupy, then toss in the salad onions and steak, and stir together. 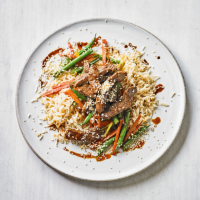 Heat the rice according to the pack instructions and serve with the beef and vegetables, sprinkled with the sesame seeds.